I am a bibliophile. You can read about it here. Well in this series I will give information about the old, used book seller markets that I have visited so far. 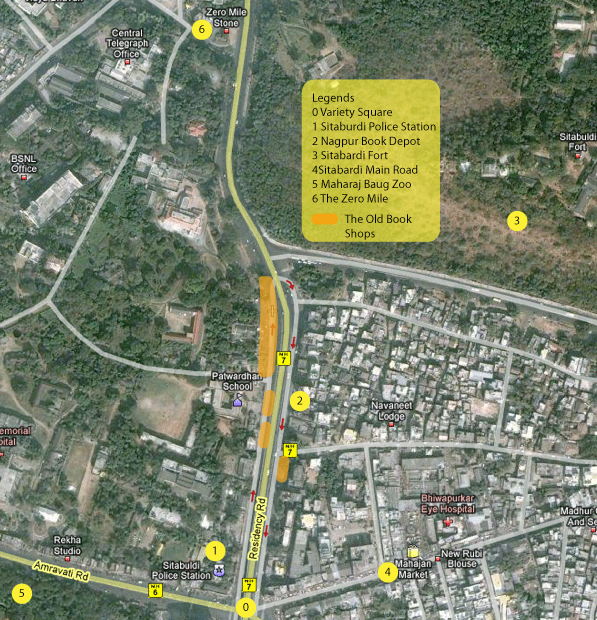 I will begin with my hometown of Nagpur [नागपुर] where I started collecting books. 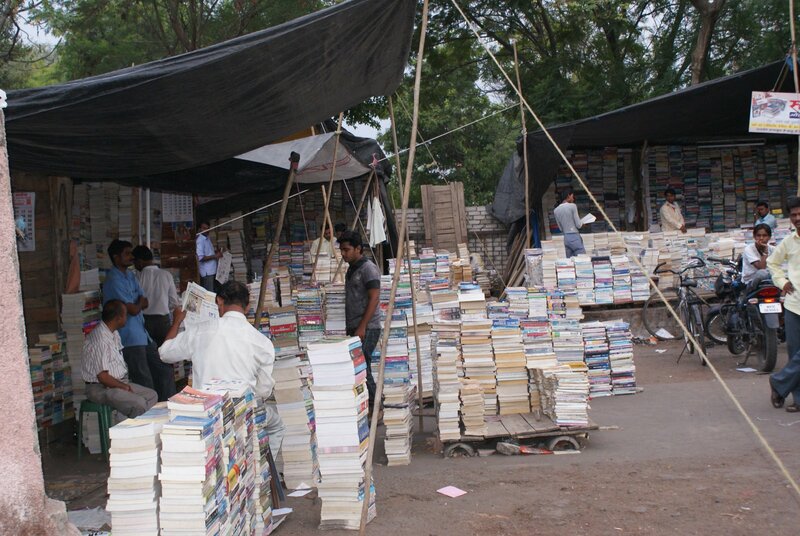 The old book market in Nagpur is in the heart of the city near Variety Square, Sitabardi [सिताबर्डी]. There was a old cinema named Variety when I was a kid, now this has been replaced by a multiplex. Very near to this is the Maharaj Baug Zoo [महाराज बाग प्राणीसंग्रहालय]. Now this place is not only the heart of city but also the heart of India, literally speaking. The Zero Mile [label 6 in the map] is just about 200 meters from this place. The Zero Mile in Nagpur is supposed to the geographical centre of India. See the map below. Initially the book sellers were quite spread around this area, with book shops being setup on either side of the road, but now they have been restricted mostly to the western side [right side of the road if you start from Variety Square towards Zero mile] of the Residency Road and a pocket on the eastern side of the road. Now since a flyover is constructed here you an get down the flyover and park the vehicle just in front of where the major book sellers are situated. Morbhavan [मोरभवन] the Depot for City Bus is just 100 meters from Variety Square. Also this is very near to the place where shooting incidence of Gowari tribals happened some years back. There is a memorial for this just after the book shops end. And you can see a Giant Orange telling that you are in the Orange City. But I recommend that you start from the Sitaburdi Police Station which is at N-W corner of Variety Square [label 1 in the map]. Keep walking and you will see some book shops on the pavement and footpath of the road. Much further ahead just as the walls of the Patwardhan High School end, you will find about a dozen or so shops, well stacked with books of every kind. Here are some of photos from my last trip. The most abundant books that you will get here, as is the case with any other used books shop are the ones required for degree/diploma courses. Mostly these are second grade books written with just one intention of passing the exams the likes of VBD, Pragati etc. And of course there are books for various types of exams. And then there are host of magazines which find there way here. But to get some really good stuff you will have to hunt through what seem like endless stacks of books. Then suddenly like an epiphany you will find a gem of a book. As far as Mir/ Russian publication books are concerned Delhi and Bombay are dying out, I have not found many in these cities so far. But Nagpur is an exception. Everytime I go there are Mir/Russian publications always to be found. Apart from the Russian publications some times I have found quite some good books here. After all I began my collection from here. A few of the notable books that I have brought recently from here include the Flora of Marathwada Vol 1 and 2, Handbook of Optics Vol 1 and 2. Mostly you will have to bargain for the prices that the book sellers quote. They will decide the price by seeing you and your interest in the book. A good way is to start at the halfway mark. But it depends on how seriously you want the book. A good strategy is to take more than one book and then bargain, this way you probably will get it cheaper [cheaper by the dozen?]. As soon as you enter this arena, many of the sellers might call you, to their shops, it can be a bit intimidating if you are not used to it. But anyways they mean no harm. 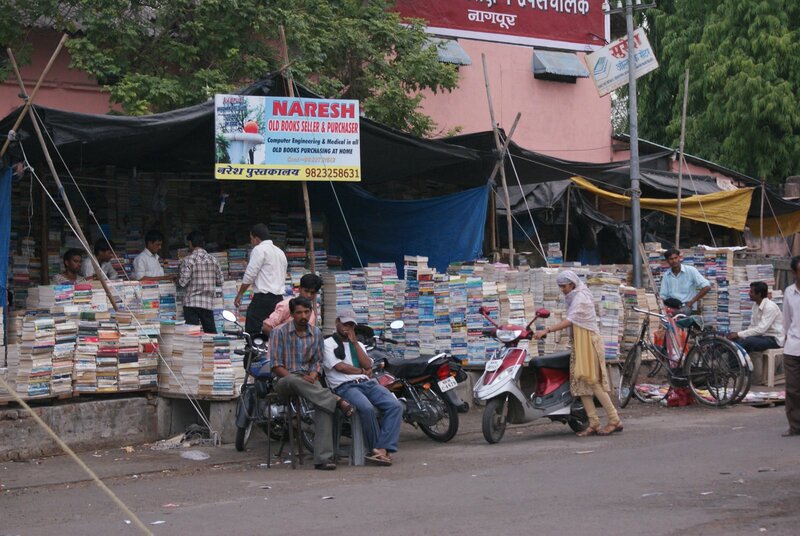 Just on the opposite side of these sellers is one of the oldest book stores in Nagpur, the Nagpur Book Depot [label 2 in the map]. You can just go there and see if can find something interesting there. They give about 10-15% discount on the list price. Along this side of the road there are two further old/used book shops, which might harbour some gems. So don’t miss them when you go back to variety square. Best time to go is on a lazy afternoon. The shops don’t open too early in the morning so don’t go too early. They stay on till the daylight allows the books to be seen. Open on all days of the week. 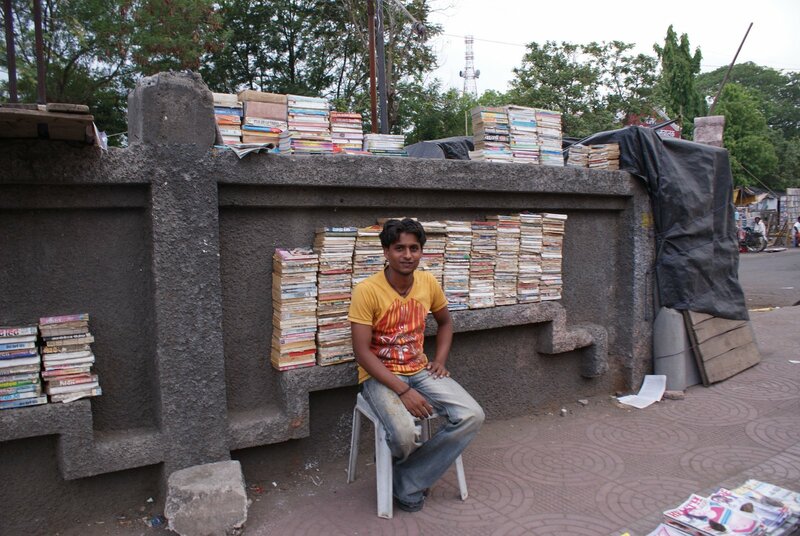 In the next part of this series we will explore some of the old book shops in Pune. This entry was posted in bibliophile, maharaj bag, Nagpur, old book shops, old books. used books. old books market, second hand books, sitabardi, stitabuildi, variety square, zero mile. Bookmark the permalink. You can write me a mail!